Sue Lowell Gallion writes for children because she is passionate about children, reading, and any combination of the two! Her upcoming books are an early reader series, Tip and Tucker, written with children’s author pal Ann Ingalls and illustrated by Brazilian illustrator Andre Ceolin. The first book in the series, Tip and Tucker Road Trip, will releases March 19, 2019 from Sleeping Bear Press. The second in the series, Tip and Tucker Hide and Squeak, releases in August. Pug Meets Pig, illustrated by Joyce Wan (Beach Lane Books/Simon & Schuster) released on Sept. 27, 2016, with a starred review from Publishers Weekly. Pug Meets Pig is now in its second printing. Another Pug and Pig adventure, Pug & Pig Trick-or-Treat, also illustrated by Joyce Wan, released July 25, 2017, with starred reviews from both Publishers Weekly and Kirkus. In 2013, Sue received the Most Promising Picture Book Manuscript award from SCBWI (Society of Children’s Book Writers and Illustrators). Sue’s stories, poems, and activity rhymes have been published in children’s magazines including Highlights and High Five. As a printer’s daughter, Sue grew up surrounded by the smells of paper and ink and the sound of printing presses. Want to hear what the pressroom sounded like? Turn your volume way up. Today Sue lives in the Kansas City area. Kansas City is a city in two different states. There’s a road called State Line Road not far from Sue’s house. She lives on the Kansas side. The state of Missouri is on the other side of the road. Sue’s family includes her husband, daughter, son and daughter-in-law, and two little grandsons. Another important member of her family is her black lab mix, Tucker, who likes to go on walks and hold hands. Sue is available for library, preschool, and elementary school visits, including free classroom Skype sessions, and also speaks to parents and early childhood educators. She shares books with kids every week through Lead to Read, a Kansas City program matching readers with public school first and second graders. 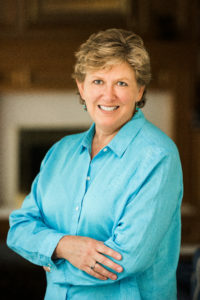 She is active in the Society of Children’s Book Writers and Illustrators (SCBWI) and served as the regional advisor for the Kansas/Missouri region.